It's nice living in a town with a decent cheesemonger. The unfortunately named Pennsylvania Macaroni Company is the go-to place in Pittsburgh. Located in the culinary center of town, the Strip, Penn Mac provides brusque, unsentimental service and a decent array of interesting cheeses at reasonable prices; 1 pound minimum. Their selection covers an impressive, though not encyclopedic, array of cheesy comestibles. If you go on a Saturday, when it's packed, please know what you want in advance and don't dither. I'm probably standing behind you, and I'm hungry. Since Penn Mac is basically a wholesale Italian Store (back in New Jersey they call places like this "pork stores"), it's not surprising that their selection of Italian cheeses is comprehensive (try the Pastore Sini). They also have a nice selection of the more common French soft cheeses -- none truly young enough, of course, because the United States' Food and Drug Administration is composed of ignorant simian microcephalic cretins. There's a decent selection of British cheddar-alikes, Spanish cheeses of various pedigrees including a very aggressive Cabrales, and a growing group of Portuguese entries. They do not carry Gjetost, and for this, I salute them. They're also very interested in finding superb domestic cheeses -- I've seen more domestic goat cheeses at Penn Mac than anywhere else. Penn Mac will also conveniently provide one stop shopping for olives, cured meat, pasta, olive oil, baccala, and many other foods that make life worth living. But it's the cheese that draws me in, every time. This week's main pick for me was Bleu d'Auvergne, a cow's milk blue cheese with a creamy texture but a wonderful sulfurous nose. It goes well with port (but then, what doesn't?). Whole Foods has some interesting cheeses not available at Penn Mac, if you don't mind paying twice the price (quick comparison: Roquefort Abeille is $10/lb at Penn Mac, $18/lb at Whole Foods. That's a representative markup). If you're fixated on a specific cheese that Penn Mac doesn't have, that's not unreasonable. Another viable tactic is to drive to Toronto and go to Alex's Farm Products in the St. Lawrence Market (or their open 7 days a week outlet in the Manulife Center). You'll pay less (as long as we're not counting gas and tolls), have a better selection, have access to young raw milk French cheeses, and hey, you'll be in Toronto. 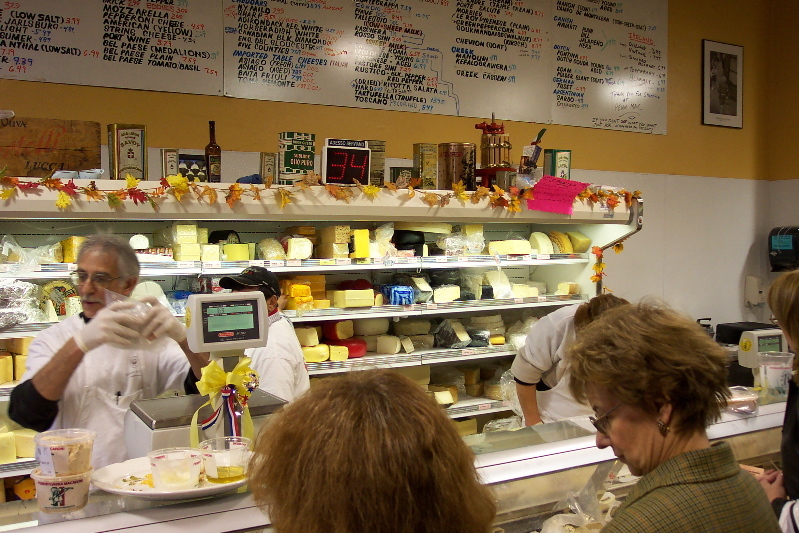 If you're determined to not travel to another country to get your cheese while in Pittsburgh, you can also go to McGinnis Sisters, which isn't really as good an option as either Penn Mac or Whole Foods. In their favor, their product is always extremely fresh, so they're already miles ahead of Giant Eagle. Their selection is more limited, though, and they have an annoying habit of renaming cheeses to suit their whims, which offends my sensibilities. Penn Mac's cheese department has a web site.